The kids had a Walkathon in school to raise money to buy some laptops. It was supposed to be last week but it rained heavily in the days leading up to it so it was postponed until today in the hope of better weather. It certainly was warmer. 38 degrees. Hot, Hot, HOT! The poor kids were covered in sun screen, had their hats on their heads and cold bottles of water in their hands. The loop was just over 1Km long. It started in the school and worked its way through the car park, down through the bush and the sports fields before returning up the hill to the school again. They were allowed to do as many laps as they wanted but in the extreme heat with intense sunshine and hot wind blowing in their faces many of them were lucky to finish three laps before giving up hot, sticky but proud to have done enough to earn their sponsorship. 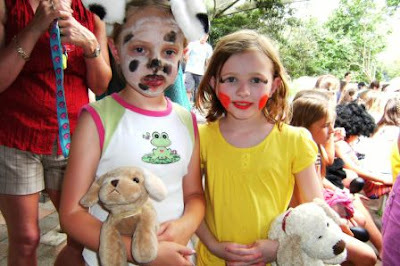 After the mornings exertion they had a fun afternoon doing a "Talent quest" A chance to get up on stage and tell a few jokes, sing along to a song or anything else that took their fancy. Rhiannon did a song about nagging your Dad for a puppy. It was written by Mrs Cootes husband (Rhiannon's teacher) and is based on their daughter when she was younger. Guess what. It worked and Madeline did get a puppy after all her nagging. Great message there for all the easily influenced 8 year olds! Thanks Mr Cootes! I thought you might like to hear about my first snake scare here in Australia. So far my only experience of snakes has been safely behind glass at the zoo. I am aware that there are plenty of snakes in Australia but luckily not overly common in this area unless you go bush walking. Occasionally though you read stories about snakes finding their way into peoples houses. That's just news stories. That would never happen to me.... would it? OK. Sit back, take a deep breath. It's 6am. The alarm goes off and I stumble down the stairs to make a cup of tea before the kids wake up. The kitchen is dark and a bit of a mess with things all over the kitchen counter. I reach out to switch on the kettle. There it is.... dark, coiled and only inches from my hand. My heart goes cold. I mean physically cold. It starts to move, uncoiling faster and faster sliding over the edge of the counter and onto the floor next to my bare feet. I'm frozen, cant breath never mind scream. The adrenaline rushes into my blood-stream and my eyes focus in the half light. Since Mrs B started back nursing, some of her shifts are fairly early. To be honest, this filled me dread as the thought of having to get 3 kids ready for school (fed, dressed, lunches and bags packed, homework, and stuff for other school events) AND get myself ready seemed a little daunting. Mrs B to the rescue! Even though she left at 6:30am today we found this noticeboard on the kitchen counter - I'm not sure how she does it. 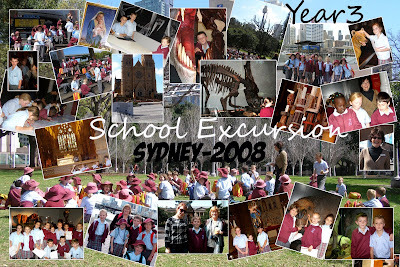 Rhiannon's class went on an excursion to Sydney in September. Here is a great Photo collage that was put together by one of the mums, Kerri Brady. Kerri is a professional photographer and does a lot of photo work for the school on a totally voluntary basis and never expects anything in return. It is great to get to see photos like these as it gives a great fun insight into what our kids get up to when they are away from us! When I was a kid I loved helping my Mum when she baked homemade cakes. 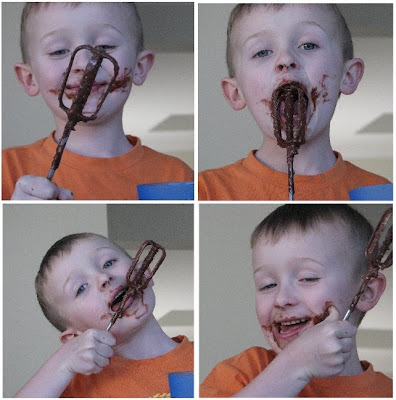 The best bit was always at the end when we got to lick the bowl and the beaters! Some things never change !!! Some Saturdays are early ones. Some Saturdays are busy ones. Today was different. After a late last night at a fantastic Greek restaurant we decided to do as little as possible today. And by little, I mean nothing. We've invested so much into our garden that a day spent just sitting by the pool was long overdue. Breakfast? Outside on the patio. Lunch? Barby on the patio. Mid afternoon munchies? By the pool. And the kids? I'm sure they enjoyed it too! 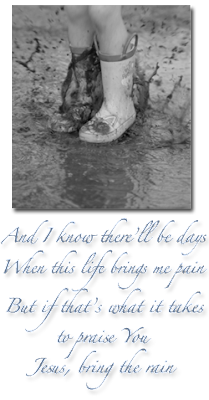 I regularly read a blog called "Bring The Rain" It is written by an American woman Angie Smith who's baby Audrey died shortly after birth in April of this year. Angie wrote a blog during Audreys pregnancy describing what she and her family were going through. So many women read this blog and leave comments linking to their own stories. Today on Angies blog I read that it is the National Day of Remembrance for pregnancy and infant loss. She asked women who had lost a baby to leave a comment telling of their babies story. I left my comment. It was almost the 700th and comments are continuing to be added. For anyone out there who has lost a baby I am thinking of you tonight as are the hundreds of women around the world that have shared your experience. I feel sadness in my heart when I think about the baby we lost back in 2001 but then I look at Sian, Rhiannon and Gareth tucked up in their beds sleeping, happy and healthy and I know that I am a very lucky Mum. I help out with reading in the kids school on Wednesdays. 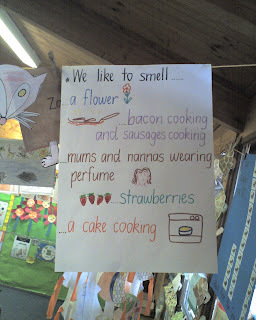 When I had finished in Rhiannon's class I wandered over to Gareth's. The room was empty. The Kindy kids were having a library lesson across the playground. I hung around waiting and started looking at the artwork hanging around. Do you think if Byron reads this blog he might go out and buy me a bunch of flowers? A new bottle of perfume? Some freshly baked muffins? Strawberries? What the hell, I'd settle for a bacon sandwich! 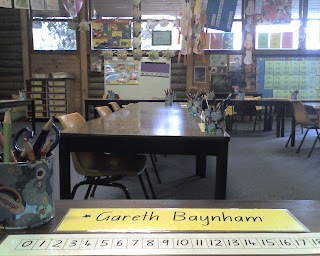 The kids desks have been re-arranged this term and I found Gareth's name. Sian and Rhiannon wanted to do a sleepover with their friends Sophie and Gemma this holidays. We have started to a double swap where the two older girls stay at one house and the younger girls at the other house. This time it was my turn to have the younger, wilder, noisier ones! The evening itself went quickly. The girls played, had dinner, watched the end of a movie, had hot chocolate (Made by Mr B) with marshmallows, chocolate flakes on top and a slab of Cadbury's top deck on the side! How much sugar do you need to give two already crazy 8 year olds just before bedtime..?! Despite the sugar the girls were good as gold and went to bed whispering and playing Littlest Pet Shop until I turned out the lights. ....with every possible combination of sugar, lemon juice, nutella, and strawberries possible. To burn off all that sugar rush we threw them into the pool and decided to put the inflatable boat in too. They used pure sugar fuelled energy to "motor" the boat up and down the pool at great speed! They had great fun in it and even tried to sink it by filling it up with water and getting in too! As you can see the only thing going to the bottom of the pool was them! The first thing we noticed was swirls of pink in the water of the lake. Was it fish eggs? Algae? We had not noticed anything like it before. Then we saw a snake! A real black snake coiled around a tree. This was not the first time to see this snake. 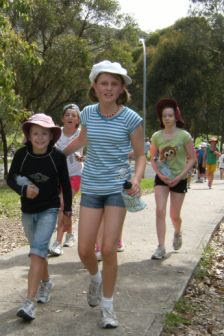 The kids went for a walk with Anne last month while I was in Sydney with Nessa. They saw a black snake in the same tree that time too. Its tail was slowly moving in the breeze so they had kept their distance from it. Imagine their surprise when we saw it again today. Imagine all our surprise when we realised it was RUBBER! After a pit stop where we stuffed our faces and drank our orange we turned back. We saw a few odd looking things washed up on the shoreline. They were about the size of an adult shoe, were rubbery and oozing a red liquid? Could they be responsible for the pink swirls in the water? They almost looked like they had a shell embedded in their backs? When we came across one that was alive we saw it had four protruding feelers almost like a snail. We guess it is some kind of sea slug? We had a phone call from Anne today telling us that we had to call in for a quick visit. They had a very special visitor... A baby Wombat! It was rescued from the side of the road by their friend Peter and is being bottle fed with formula from the vet until it is old enough to be released back into the wild. She was the funniest little thing. Small and solid like a rugby ball and determined to wriggle into any gaps she could find in our clothing. Looking for her Mums pouch I guess! The kids had a lovely time cuddling her and were sad to say goodbye. I am guessing that she will be a lot bigger the next time we get to see her! Especially ones for the kitchen. Clearly I don't need any more gadgets. Well that's what I thought until I saw one of these babies in action! How could I have lived without one for so long? How many apples can three kids get through in a day? How long until the novelty wears off and it finds itself at the back of a dark cupboard? Who cares! For now we are slinkying for breakfast, lunch and tea. The fruit bowl is disappearing in front of our eyes and the kids are getting their fruit intake for the day without any arguing. We went camping this weekend. It was a public holiday weekend so we booked into a local campsite for three nights with some other families we know. The weather forecast was looking bad as the week progressed and we were getting more and more concerned as to whether we may have to cancel. On more than one occasion many of you have teased us about having a "perfect life" where our weeks are made up of home baked cookies and idyllic trips to the beach. I have often tried defending by saying that an edited life appears here on our blog. I have decided to write two blogs about this weekend. Both are 100% true. One is the moaning and miserable version that will cheer a few of you up, the other is the Gina's edited blog version! Click on the comment button below and tell me which one you enjoyed most! I had a manic week trying to juggle the kids being on school holidays with working every evening in the hospital. Byron got in the door about 10minutes before I needed to leave and there were no relaxed family meals around the kitchen table. I accepted work on Friday evening having forgotten that we were due to start our camping weekend that afternoon. As the week progressed the weather forecast was warning about a storm front approaching. It was due to hit on Friday. We decided to sit out the storm on Friday night in our house and start the camping on Saturday morning. Friday night passed without a drop of rain and we woke to a stinking hot day on Saturday morning. We dripped with sweat as we packed the tents, mattresses, towels, food, clothes and camp chairs into the car. We eventually left the house and got to the campsite. Just as we hammered the last tent peg in place with a flip flop (we forgot our hammer) the heavens opened and we had to retreat to the only sheltered spot we could see: the veranda outside the men's toilets. We sat there for the next few hours as the rain continued to pour down. As we watched our tent from the shelter we realised that we had chosen the end of a rain gully to put our two tents and they were now flooding. We ran down and got soaked to the skin as we unpegged the tents and carried them to higher ground and re-pegged them. All the kids rucksacks were soaking and their spare clothes and pj's were dripping with water. We slept in our damp clothes and tossed and turned at all the unfamiliar sounds. Saturday passed without much incident, a few more showers but nothing major. We woke to thunder and lightning on Monday morning and torrential rain. We sat under a marquee and watched as the grass turned to mud and eventually admitted defeat and took the mud soaked tents down in the rain and bundled them into the boot of the car in black plastic bags. When I went to start the car up so that I could deliver the wet stuff home and return for Byron and the kids it wouldn't start. The battery had died and no amount of turning the key was going to start it. What an end to our first (and bloody last) camping trip. I had a great week, spending time with the kids during the daytime and still being able to earn money by doing some short evening shifts when Byron got home from his work. Despite warnings of a major storm on Friday the sun shone and we packed excitedly for our weekend away. We left on Saturday morning and miraculously managed to get the last tent peg firmly in place and mattresses pumped before the first drops of rain started. We got shelter on a veranda and set up a camping stove and made cups of tea and toasted marshmallows on sticks. We even got to oggle all the fine strapping young men coming out in their towels after their showers! On Sunday morning we woke to a perfect still lake that we could see from the door of the tent. We set the kettle on the camping stove and a cup of tea in bed! When we got back to camp some friends joined us and the kids spent the afternoon splashing about in a little boat in the lake while the grown ups sat around watching them and chatting. We had a take away meal of fish and chips together by the light of a gas lantern and sat up drinking wine and laughing as the kids ran around playing. We finished off the evening by toasting more marsh mallows over the camping stove. After another (more reasonable!) nights sleep we awoke at 6am to a torrential downpour of rain complete with thunder and lightning. We put the kettle on and had another early morning tea in the shelter of the tent. We finally admitted defeat to the weather we took the tents down in the rain and bundled them away in the car to be dried out at home. When the car wouldn't start we had Mark jump to our rescue with some jump leads and we were on our way home for showers and were already planning the next group camping holiday in 2009! So now it is over to you. Click on the little comments button below right and tell me which kind of version you want to see more of in future blogs!